On Monday of this week I went to our church and baked cookies and goodies for the day with my friends Anneliese and Kathy from MGCC. . .
and Dorothy my good friend from the B&B and we were joined by new friends Annette and Sterling. 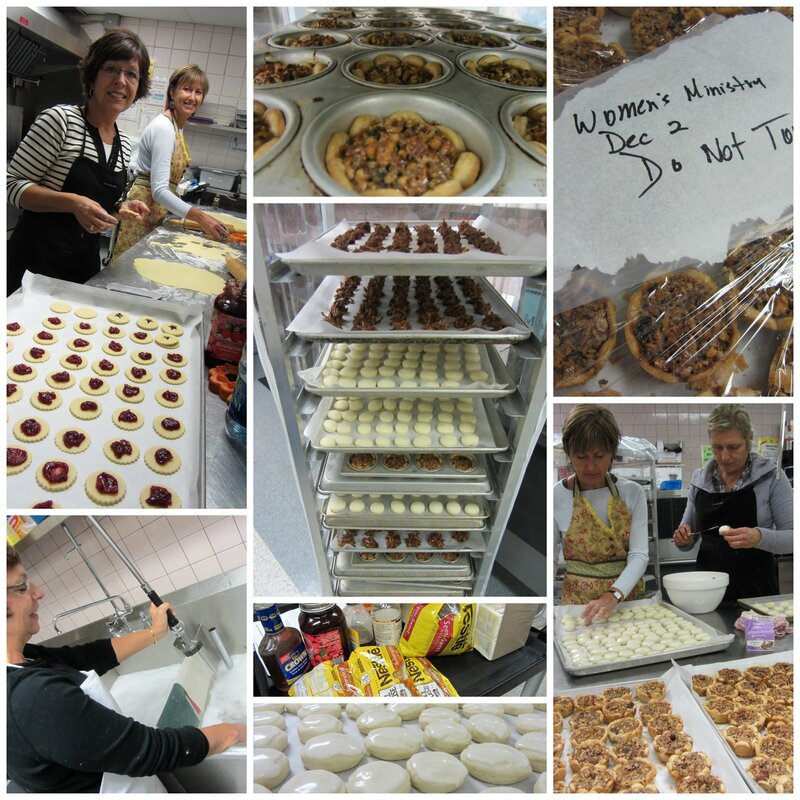 If you haven't spent a day baking up a storm lately with other women .. .
We chatted. ..and enjoyed some lunch together thanks to the Mr. from the B&B. They will be eating those goodies at the Church's Women's Ministry Christmas Party. I think they will have a wonderful time! I won't be there. .
and I don't even feel bad saying so. I think they are in for some good eats at their party tonight! Do they 'let out' the facilities for a private bake party? I'm thinking...some good friends...a day in the kitchen...and we each leave with enough baking to last us through the holidays! Yes, I agree with Judy, and bring on the young ones...they bring that interesting zest for life. Just think how easy our baking would become. that looks amazing...your church has a fabulous set up! Perfect for a major baking day! and everything looked so yummy! It must be fun to use a professional kitchen to have a holiday party bake-a-thon, Lovella! Your cookies look fantastic. You girls always look great in any kitchen!! You must feel very very sorry for me because I've never spent any time baking with that many other women...just my mom and sister. It does look like a lot of fun. Birthday party called you off tonight I think. Sorry about wandering all over your blog. I was here reading the post that I, until now, hadn't read when John arrived wanting to know who that guy was (your son) and one thing just led to another and then I zipped off forgetting to comment here. today-I had to bake all by myself. It really wasn't much fun, I have to admit! Oh, your cookies look a whole lot better too. That looks like a wonderful day and the cookies look scrumptious. I have been baking by myself for the past few years. It does look like a lot more fun to do with friends. I have a feeling you will be attending a party for one of your grands. Wow...so many many cookies. Wonderful, great fun that must have been! 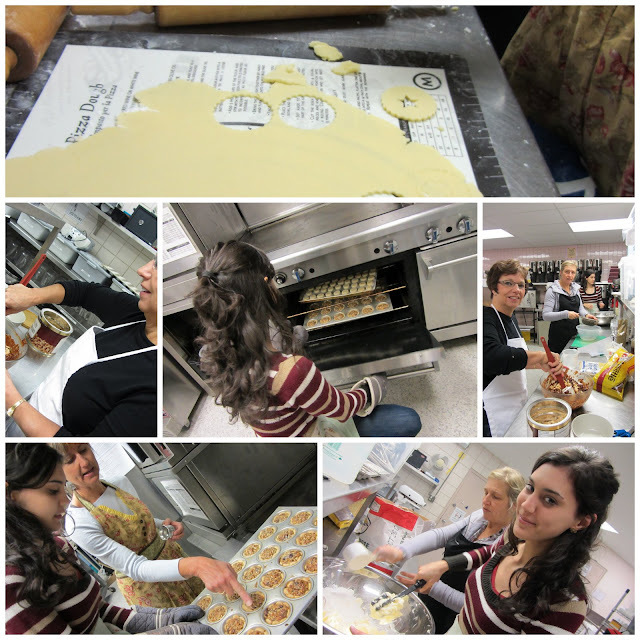 It was fun to be there and bake together. You got such anice pictures! I wonder how the evening went last night?